Much has been made in recent weeks of the shared birthday of Abraham Lincoln and Charles Darwin, two juggernauts not only of their own age, but of all the years since. 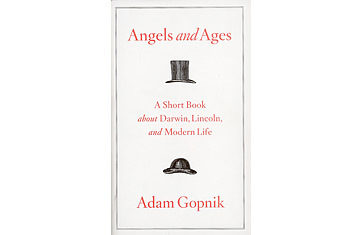 New Yorker writer Adam Gopnik explores their legacies in this book-length series of essays, focusing on their abilities as writers and thinkers of the highest caliber. As Gopnik writes, "Literary eloquence is essential to liberal civilization; our heroes should be men and women possessed by the urgency of utterance." With their adherence to logic and observation, and devotion to thoughtful expression, Lincoln and Darwin  in addition to everything else they accomplished  helped kickstart the engine of the modern age. 1. On the origin of Lincoln's facility with words: "The frontier America of Lincoln's youth was first of all a rhetorical society, where the ability to speak in public, at length was central to social ambitions; giving a speech in 1838 in Illinois was the equivalent of putting on a play in 1598 in London, the thing you did into which everything else flowed. (We are, by turn  and a writer says it with sadness  essentially a society of images: a viral YouTube video, an advertising image, proliferates and sums up our desires; anyone who can't play the image game has a hard time playing any public game at all.)" 2. On the larger effects of Darwin's writing: "[T]he most important way in which Darwin altered his era was by getting people who did do science to ask a new kind of question. Some scientific revolutions have surprisingly small ideological aftershocks; Michael Faraday's discovery that electricity and magnetism are the same thing was as large a discovery as any in the history of science, but it had a paltry aftereffect...For a new scientific theory to become a model in its time, vastly influential outside its immediate claims, it has to release thinking people from a bond that they had long recognized as too narrow and help them interrogate the world in a new way." 3. On why everyone should read On the Origin of Species: "Great books of science, like all great books, are worth reading not just for what they add to objective knowledge; they are worth reading because they advance our liberal education. Just as we don't read Dante for a sneak peek at the afterlife or because we expect someday to be confronted with a diabolical architecture of circles within circles and punishments suited to our sins, we don't read Darwin because what he says is what scientists now believe  much of it isn't. We read him because a book of eloquent argument and well-ordered evidence...reminds us of the powers of the human mind to bring light to darkness, make a clearing in the wood of confusion." Rather than a biographical re-hash  wise, for possibly only Jesus bests Lincoln in the number of published books devoted to a single person  Gopnik offers a meditation on each man's most literary qualities: Lincoln's deceptively simple legalistic language and Darwin's crystalline powers of observation. And what could have been a gimmick (a book timed to twin bicentennials is as close as historical biographies get to a home run) becomes something more, a learned treatise that worships learning. Gone is the overly twee writing of Gopnik's memoir-inflected works (Paris to the Moon, Through the Children's Gate), and in its place is a succint, convincing, and moving account of how two men ripped mankind out of its past unreason and thrust it into a more enlightened age. Much has flowed from them.